Just as the castaways were left to languish on Gilligan's Island, so, too, did cancellation deprive fans of seeing Col. Hogan (Bob Crane) and company finally liberated from Stalag 13. But at least this controversial series (again; it's a P.O.W., and not a concentration, camp!) went out literally with a bang, another successful act of sabotage of Nazi operations. The sixth season brought a new face to the barracks, Kenneth Washington as Sgt. Baker, replacing (without explanation) Ivan Dixon's "Kinch." Happily, some of the series' most entertaining recurring characters put in final appearances. Bernard Fox, as the hapless Col. Crittendon, enjoys his finest hour in the two-parter "Lady Chitterly's Lover," in which he must impersonate a look-alike British traitor, and Kathleen Freeman, as the dread Gertrude Berkhalter, upsets Hogan's plans to sneak a downed U.S. general out of camp in "Kommandant Gertrude." John Banner, as Sgt. Schultz, has one of his best episodes in "Kommandant Schultz," in which power goes to the cuddly buffoon's head when he is put in command of Stalag 13. Ten years ago while visitng my grandfather I came across an very old photograph of my grandfather with a man that looked vaguley familiar but not much. I then found out after asking my grandfather who the man was, that it was Bob Crane and he was my grandfather's second cousin on his mothers side. Being only 11 years old at the time, I had no idea who this guy was or the show of Hogan's Heroes my grandfather talked about. I started watching re runs of the show on Tvland since I was pretty much a distant relative of one of the actors. I thought the show to be very funny. My favorite character on the show was the french actor, LeBaue or something like that. I just thought he was hesterical. I came to really like the show, not for the fact that Bob Crane was my late grandfather's second cousin, but because it was a great show and a good laugh. The year the DVD's started coming out was the year my grandfather passed away. I started buying them for three reasons. One: I like the show to the point where I could watch it again on DVD, two: to have something that would give me those memories of watching it with my late grandfater and three: the fact even though I never knew him or anything about him other then the fact that he was murdered in 1978 or 1979, Bob Crane was a relative, a distant relative but a relative. It is a great show and I think many people of all ages will like it. I was eleven years old when I started watching it, now ten years later I still enjoy sitting down and getting a good laugh when watching it. When the show tried to be funny, or even when it tried to be serious, Hogan's Heroes was often better than so much of what we have on TV today- it was even better than a lot of what was on in the 60's! In watching these episodes I don't really see much difference in season 6 over the earlier ones except I think LeBeau was more often called Louis. Kenneth Washington did a good job as Kinch's replacement Baker, just shouldn't have had that 1970 style haircut. The stories, the women with their 1960's hair, makeup and clothing- the men with their 60's plastic frame glasses, and the guest stars who often appeared as diferent characters (in the same season even)- I'll miss it all. Too bad CBS didn't bother to put in anything for extras, this being the final- shortest- season they could have had some commentaries by the surviving cast at the very least. An excellent companion to the series would be Hogan's Heroes Behind the scenes at Stalag 13! by Brenda Scott Royce, it's worth enough that the DVD producers used to list it on the DVD sets (just not in the last couple of years), get it too when you order this DVD set. The Sixth & final season of HH gets some bad reviews -- many have said that the series really ran one or two seasons too long. Somewhat to the contrary, this season has some of the series' finest moments. While the absence of Ivan Dixon (Kinchloe) is certainly noticable, highlights include the 2-part "Lady Chitterly's Lover," "Operation Tiger" with a stellar performance by the great Frank Marth, "Easy Come, Easy Go," which sees Col. Klink take a trip to London, and "Look at the Pretty Snowflakes" with its memorable jam session. Standing head and shoulders above the rest, however, is "The Meister Spy," which is nothing short of absolute dramatic and comedic brilliance jammed into 25 fast-paced, intense minutes. That episode alone is worth the purchase of the series. Alas, the Sixth Season was the final year for new episodes of HOGAN'S HEROES. The only major change in this season is the unexplained absence of Ivan Dixon and his replacement by Kenneth Washington. HEROES fans have long lamented the lack of a story line that would wrapped up that particular loose end. On the other hand, at the time maybe it was a possiblility that Dixon would have returned to the show. As such, a send off episode would have been inappropriate. Still the quiet one for one replacement allows a viewer to mix and match episodes without any loss of continuity. The sixth season started out strong. In addition to the great stories we find episodes with additional "Luftwaffe" and "SS" extras marching about camp. We also find the cache of antique vehicles, formerly used one or two at a time per show, abounding in some of the Season Six episodes. Hogan and his gang remain largely unchanged from the previous five episodes. Klink, Schultz, Burkhalter, and Hochstetter also remain in character. In one episode, Kommandant Schultz, we are also treated to a slightly different version of Schultz. In that volume, as Schultz enters a leadership training program, Schultz briefly acts and looks like the Sergeant Schultz character (portrayed by a different actor) in the movie STALAG 17. Again it is still perpetual winter in Stalag 13. As a kid watching HOGAN'S HEROES on my Philco-Ford black and white television the brilliant green California foliage was not as obvious as it is in the excellently mastered color DVDs. Never the less the spray painted snow on the rooftops and patches of white powder on the ground still convey the illusion of a chilly climate. Season Six kicks off with episodes filmed using some different, and more revealing, camera angles. We are treated to views of the barracks set with the dry khaki Culver City Baldwin Hills in the background. The old RKO/Desilu water tower, from the adjacent studio, and a couple of palm trees sneak into a shot or two. Remember that HOGAN'S HEROS was filmed in the northwest corner of the 40-Acres back lot. In the early days of film the lot was in the middle of wide open spaces of a former ranch. By the 1960's the lot was surrounded by studio buildings and urban sprawl. In reviewing old aerial photographs of the 40-Acres lot, complete with views of the HOGAN'S HEROES outdoor barracks set, it is amazing that cinematographers, editors, and directors were able to make us believe that Stalag 13 was out in the country. The Gestapo and SS still don their pre-war black uniforms. Curiously most of the SS/Gestapo officers wear only one eppoulette on the right shoulder. Either someone in wardrobe made an error or the addition of "German" extras neccessitated borrowing eppoulettes for the additional uniforms. Occasionally visiting German officers wear some sort of bizzare oversized medals that you will never find in any military heraldry books. We also see that Burkhalter, who in a previous episode stated he had been in Berlin since the outbreak of the war, actually wears a German World War Two combat infantryman's badge and German wound badge. In reality thse two badges could only have been attained by actual combat duty 1939 through 1945. Remember too that at various times Colonel Klink claimed to have been in purely noncombat roles since the war, though in one episode he mentions being at the controls of his Heinkel in combat. I know, too much detail for a television series. In the end it probably would not have looked proper for an army general and Luftwaffe colonel to go without medals of some sort. In 1970 CBS moved HOGAN'S HEROES to a new time slot where it was opposite Disney. Many have felt that this was CBS's attempt to set the show up for failure and thus clean house of some of its situation comedies. Conspiracy theorists, and they may be correct, say that MAYBERRY and THE BEVERLY HILLBILLIES suffered a similar fate. There is also some credible information to indicate that Bing Crosby Productions was eager to cash in on syndication and artificially contributed to the show's demise. What ever the cause, HOGAN'S HEROES aired its last new episode in April 1971 and shortly thereafter moved into syndication history. In the early 1970s there was rumor of a Hogan's Heroes television movie with a tentative working title of "Escape from Stalag 13." The storyline reportedly would have initally taken place during the concluding days of the war with Hogan and his men extricating themselves from the POW camp along with Klink and Schultz. From there the story would have followed the former enemies in some sort of post war commercial (or possibly Cold War) venture. No doubt this would have been a pilot for a new sitcom. Alas, John Banner passed away in January 1973 and no more was heard of the project. Maybe it was better that there was no succeeding spinoff. Remember AFTER M*A*S*H? In 1976 Stalag 13 disappeared from the triangular Culver City lot. The surviving outdoor studio sets for HOGAN'S HEROES, neighboring GOMER PYLE's Camp Henderson, town of Mayberry, GONE WITH THE WIND's railroad depot, and other sites were bulldozed to make room for a new industrial park. Late 1999 entertainment news was that actor Mel Gibson was slotted to play the lead in a HOGAN'S HEROES motion picture. Werner Klemperer was also reportedly approached about reprising his role as Colonel Klink. At that time Klemperer had come to terms with regard to his most famous -- and sometimes typecasting -- television role. Klemperer even reprised the part of Wilhelm Klink, albeit a vocal performance, in a 1993 episode of THE SIMPSONS. Werner Klemperer passed away in December 2000 and the movie project seems to have been shelved, although entertainment rumors still abound on the internet about the prospect of a film. Let's face it, there is no way that any remake could surpass the original. 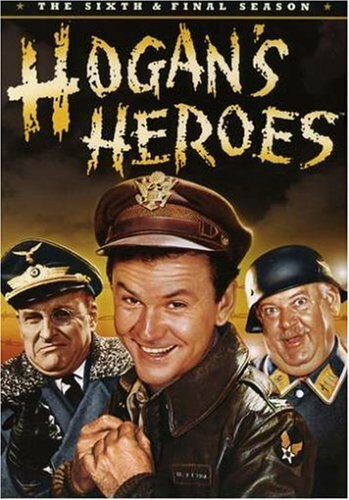 Since HOGAN'S HEROES completed its primetime run we have lost John Banner (1973), Bob Crane (1978), Howard Caine (1993), Werner Klemperer (2000), Larry Hovis (2003), and Leon Askin (2005). These fine past and surviving actors were heart and soul of HOGAN'S HEROES. A remake would be as phony as THE WILD, WILD, WEST. On the DVD episodes note that the concluding credit copyrights the show as "Hogan's Horde" and that the studio credit is Cinema General Studios. Over the course of its production HOGAN'S HEROES went from Desilu to Paramount to Cinema General Studios -- all without ever having to relocate. The show has been over for years; however they still live on in the hearts and minds of the fans. And their image remains on DVD for future generations. For me I first watched these episodes as a re-run when my Dad watched them on TV. We even had a dog names after the famous Sgt. Schultz. The Hogan's Heroes episodes look better then ever in these DVD's. After years in re-runs I was amazed at the color and quality of these episodes. Too bad the series was canceled to make more money as a re-run, back in it's day they would not produce shows and show them in re-runs. They could only show re-runs of canceled shows and Hogan's Heroes would fetch more money as a re-run, so the series ended or so my Hogan's Heroes : Behind the Scenes at Stalag 13!guide states. I now have the complete set of Every HH episodes ever made thanks to this "Hogan's Heroes - The Sixth & Final Season". Every season is full of laughs as the gang outwits the Germans. Any fan of the series will enjoy this DVD and it will complete your collection. This is one of my favorite Classic Commedy series from the 1960s/early 70s.